What makes a room ‘work’? It’s so much more than good furniture and art. While it helps to have great pieces, returning to the basic principles of design creates a space that really feels complete (no matter the style). There are six basic principles. We’ll talk about each in the coming weeks. First on the list is BALANCE. On any given day, whether at work, with family & friends, choosing what to eat, or even deciding how many of our favorite episodes of “House of Cards” we can watch in one night, we are always striving to maintain balance. Too much or too little of any one thing, and we find ourselves feeling discombobulated! In design, just as in life, the same is true, we must find balance to feel comfortable and just right. There are three types of balance (radial, asymmetrical and symmetrical) in design. Each share the principle that a room must be visually balanced through placement of furniture, art, lighting, and accessories. Take a look, and you can easily see how balance helps create a calm, comfortable space. A light fixture, table or rug is often (not always) the center point of the room. It’s all in the name! Symmetrical balance requires that certain patterns, configurations, and colors are repeated, or mirrored. Think of your early math lessons, when you were asked to fold pages and shapes in half to determine symmetry. In both pictures below, you can do this. Draw a line down the middle of the picture, and both halves are identical. 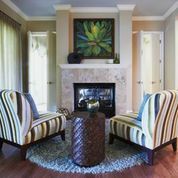 The first picture, below, is an example of symmetrical balance in a client’s home. 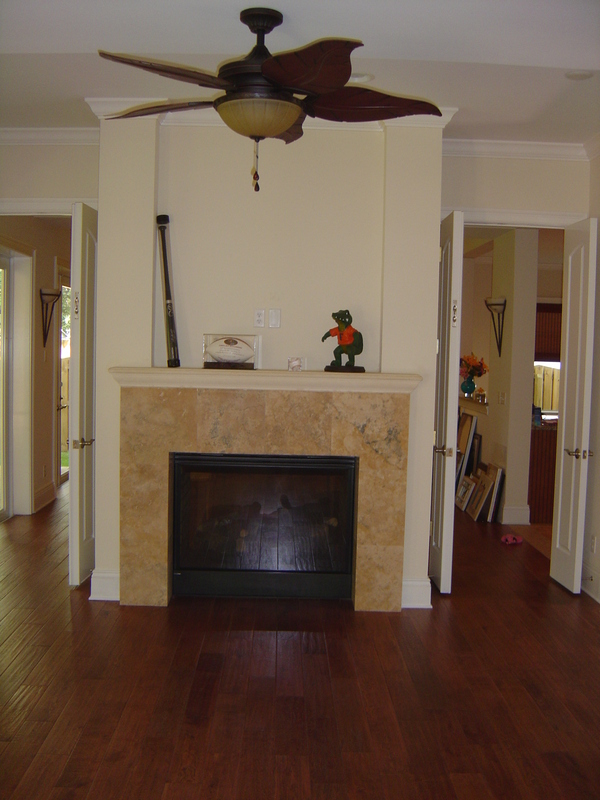 The fireplace is the focal and starting point (you can see the before picture). 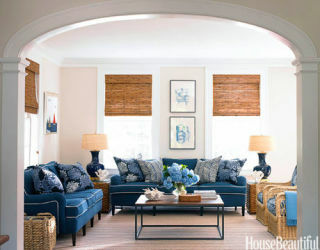 Here’s another good example from House Beautiful. 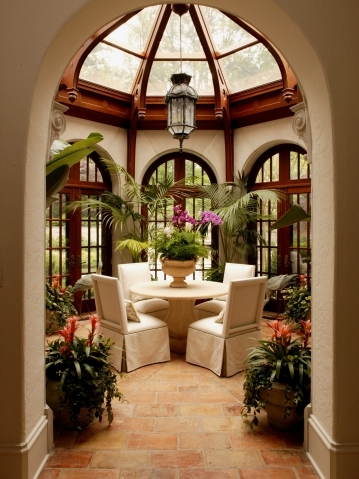 More perfect symmetry here — the chairs, brackets, palm sculptures, and vases are identical. 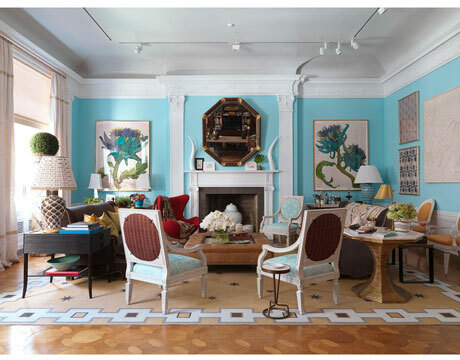 Symmetrical balance creates a clean, calm, ordered sense of style. Asymmetrical balance can be difficult to achieve, but when done correctly yields a creative result. It’s subtly nuanced, with balance often created through color and visual weight of pieces. In these rooms, you won’t see too much that is identical. 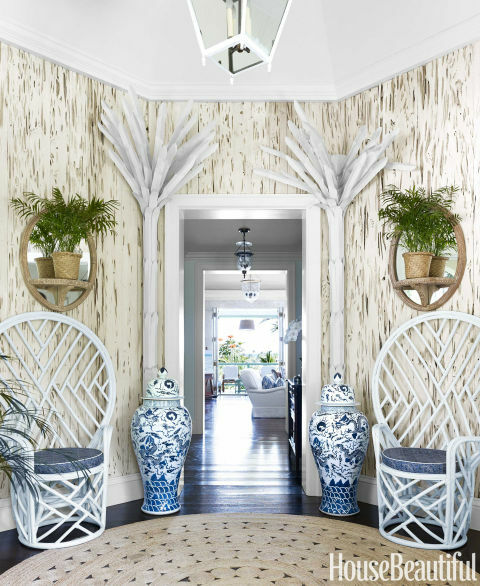 This room on luxe source.com is calm, cool and collected. Two more good examples of asymmetrical balance. Balance is important, in life and design, yet it’s often something we don’t notice, until we are off kilter. Maintaining balance provides us with stability, structure and peace! Central Florida is the Winter Strawberry Capital of the World — and the close of the annual Florida Strawberry Festival, which took place earlier this month in Plant City, Fl, has us thinking of the most beautiful and scrumptious of fruits. 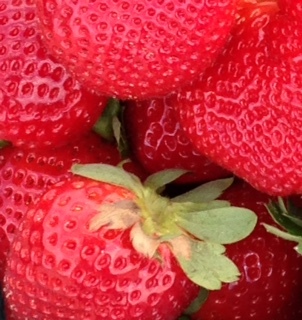 Besides it’s sweet, sugary taste, the strawberry adds color and energy to any plate. It’s that attractive red color, and how it’s a dashing and bold design choice, that we’ll be dishing about today. Red is an emotionally intense color. Red stimulates the metabolism, increases respiration rate, and raises blood pressure (in a good way!). Red indicates courage, strength, power, passion, love and danger. The color red is often used (in some variation) in dining rooms because of its appetite stimulating effect. And guess what? 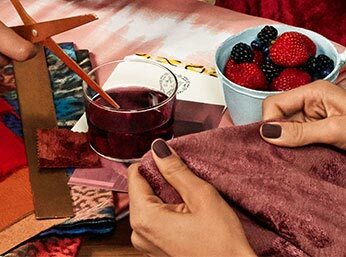 Pantone’s 2015 color of the year is Marsala – an earthy, sophisticated shade of red. 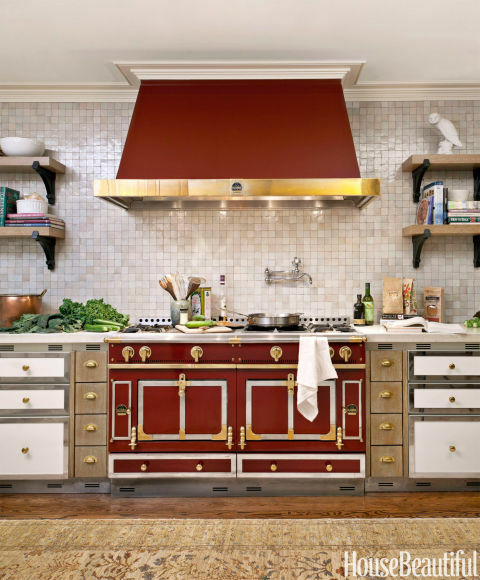 Many designers insist that each room should have at least a touch of red. 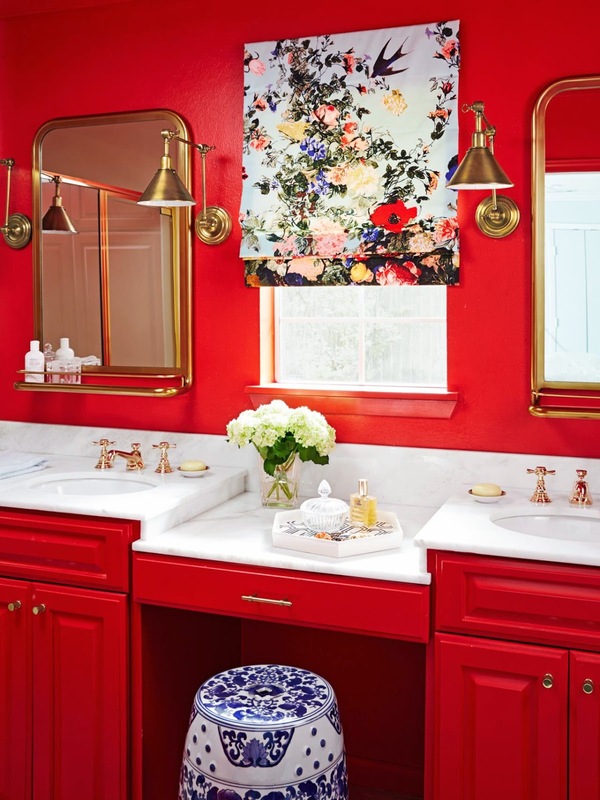 Below are some beautiful examples of a range of reds in various settings that we think are bold, bright, and daring. What’s black and white and ‘red’ all over? 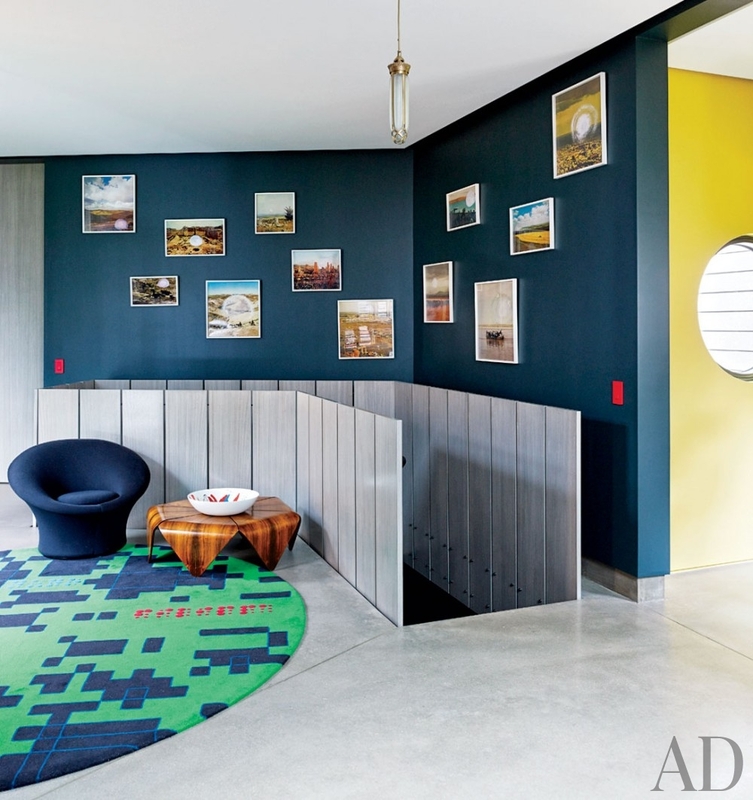 Check out the stairs below, from Architectural Digest — I love how the color is worked into the room in an original and inspiring way. Red is not just for walls! 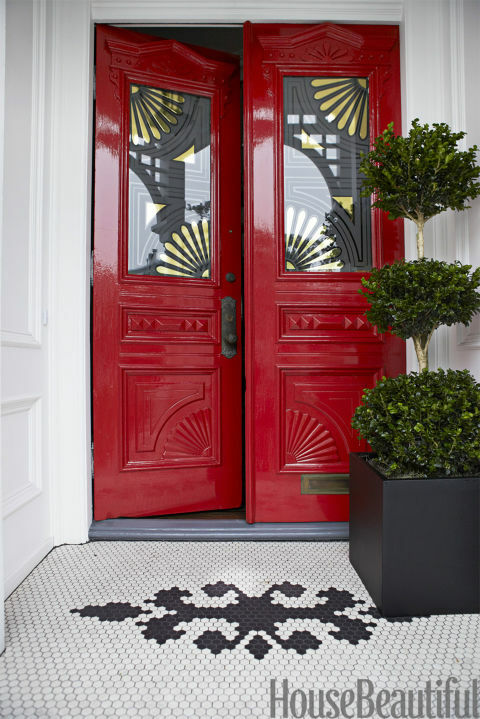 Another bold red door, below, and the black, white and red color scheme is so sharp. 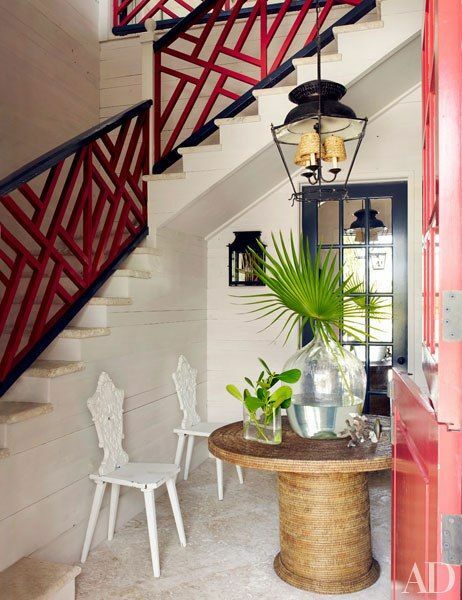 In the first photo below, by House Beautiful, you can see how red can be happy and cheerful, and also work with a softer color pallette. A softer red, from fengshuidana.com. It works with powder blue too – very pretty! Image via The Tao of Dana. Here is a great example, from the photographer Marc Wouters, of how red pops with black and can create a dramatic, moody setting! 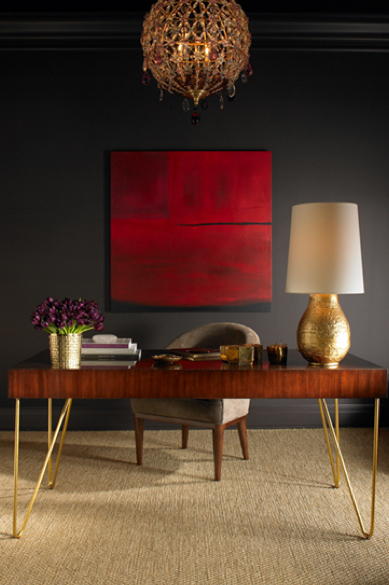 Art work provides a single touch of red, in Aerin Lauder’s office, below, yet against the black creates a dramatic mood. This dramatic, red range and hood provide all the color against a neutral backdrop. 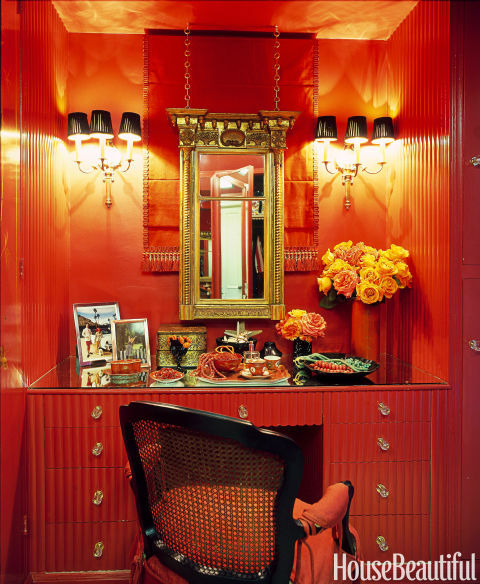 And, from Bunny Williams,this room appeared in House Beautiful in 2009 — just one red egg chair and spot the red binding on the book underneath the side table. 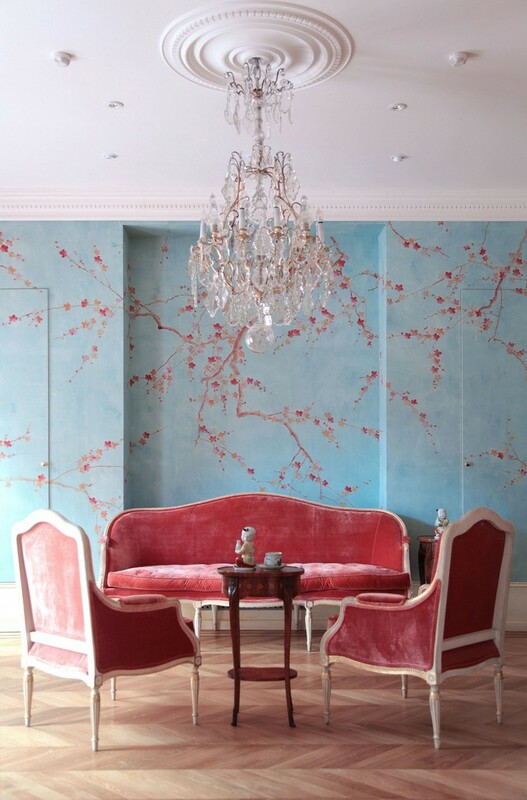 In the pictures below, you can see how a touch of red adds that extra drama and ‘oomph’ to almost any room. 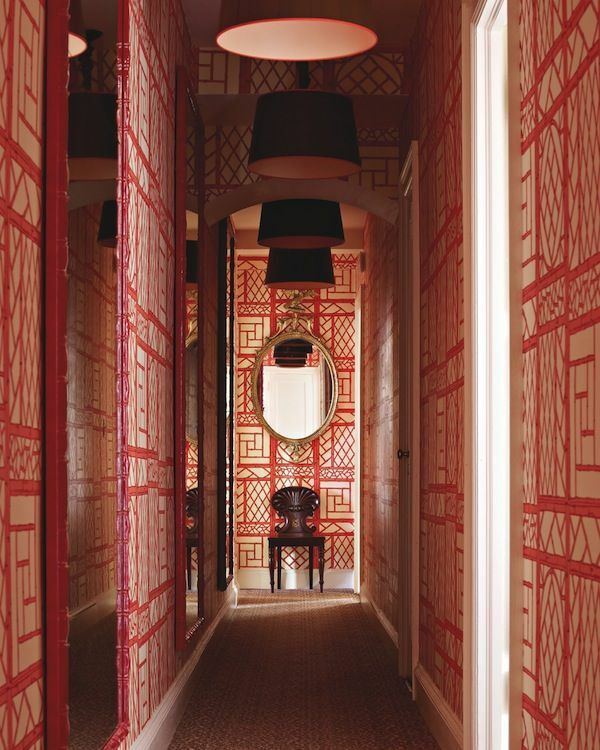 Just a ‘light’ red – a little goes a long way in this room. 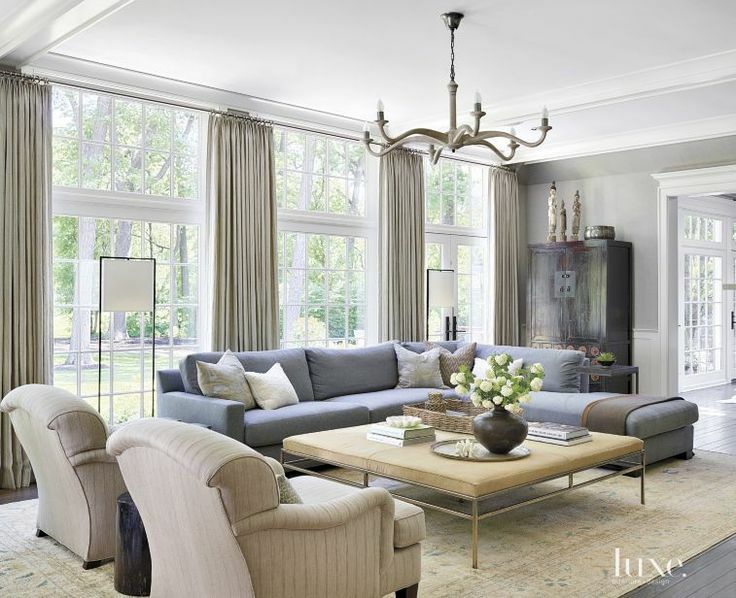 A neutral, calm pallet is energized by the red, blown glass chandelier. The last few pictures show how reds mix with almost every color. 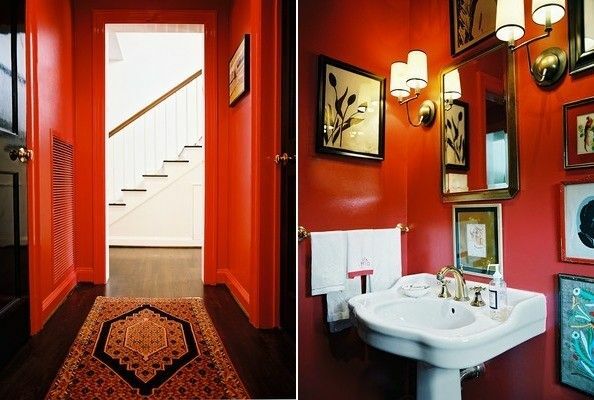 So, can you incorporate red in your home? 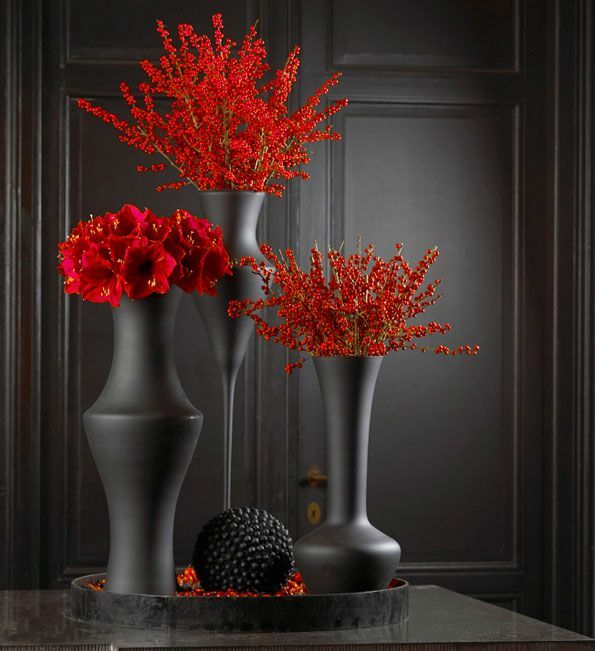 Add a pot of geraniums, or a bright throw pillow, a red vase, or a bold lamp…and remember there are many shades of red. A few weeks ago my family celebrated our Mom’s 80th birthday in Las Vegas. We stayed at The Wynn, checked out a show and played lots of slot machines! While everything is over-the-top-grand in Sin City, some things that happen in Vegas – like great interior design ideas – should not stay in Vegas. 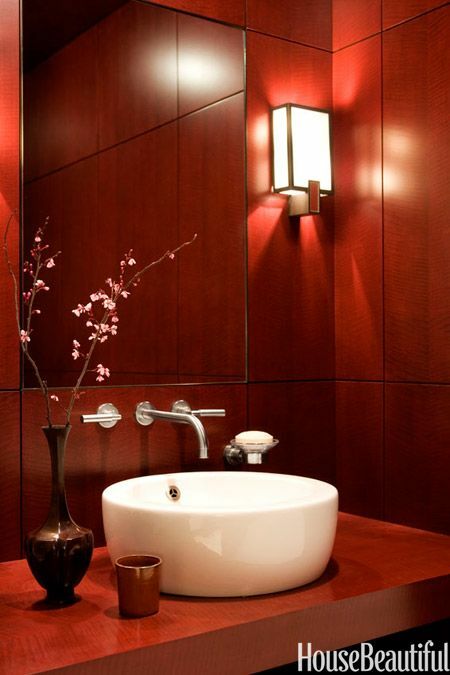 This leather wall panel is fabulous. 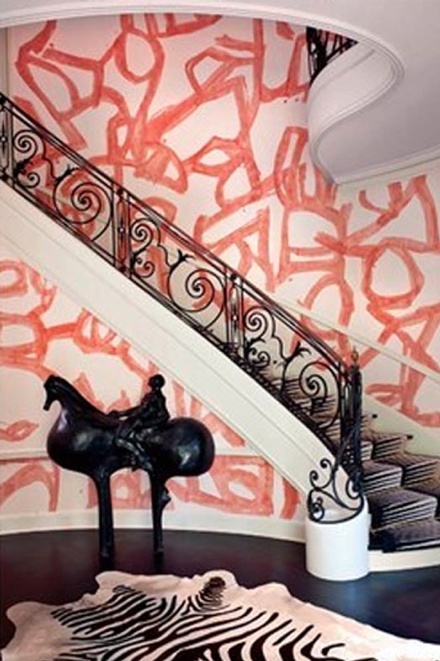 It takes leather wall covering to a new level! 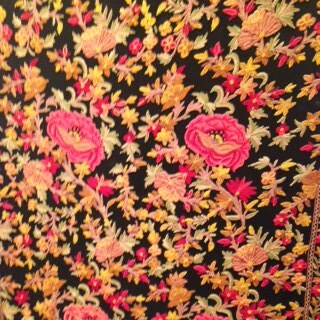 On the right, another great wall panel – a deep, rich, embroidered textile. 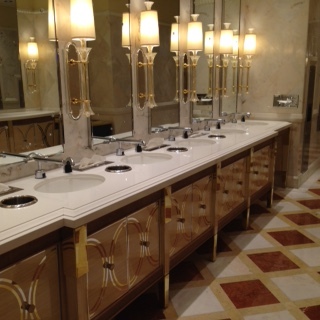 This ‘little’ powder room off The Wynn lobby featured an Art Deco vibe. Beautiful! 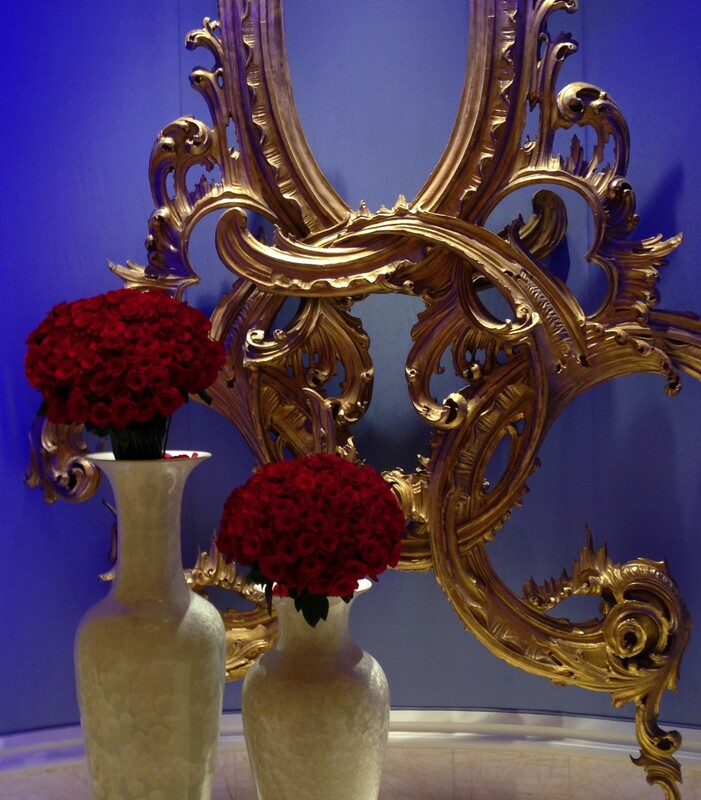 LOVED this gold framework detail and vases of red roses against a bold blue background at the end of the lobby hallway to the elevators. 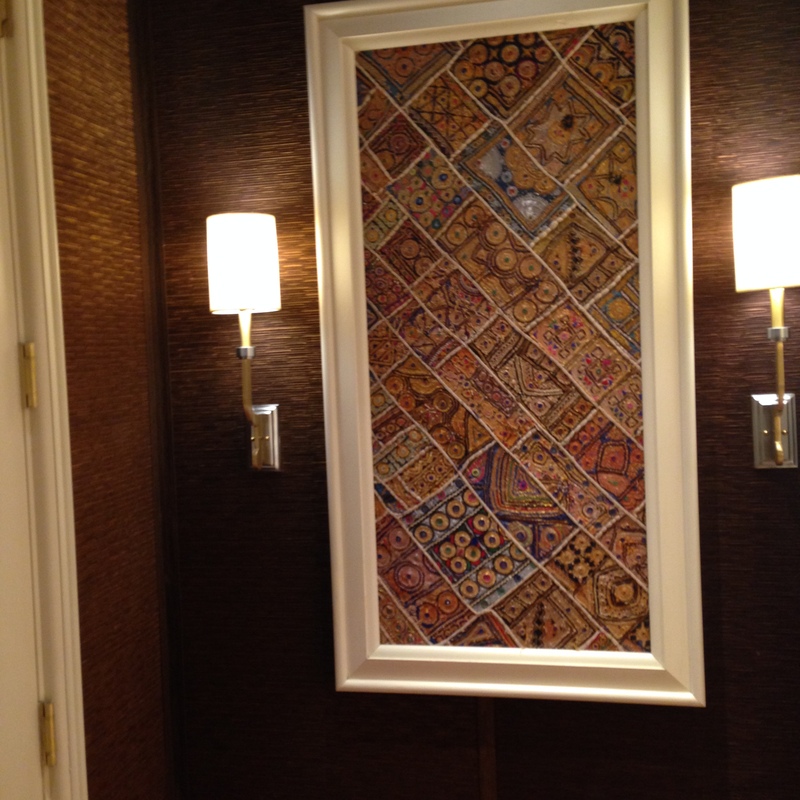 Beautiful textural framed pieces were everywhere. There was no corner that was inconsequential. There is a design lesson lurking there. 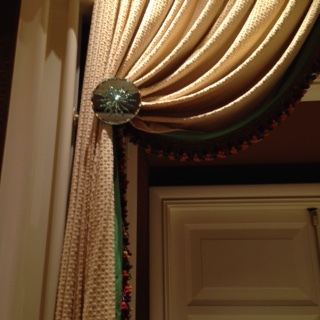 At The Wynn no detail was overlooked…loved the oversized glass drapery hold backs. 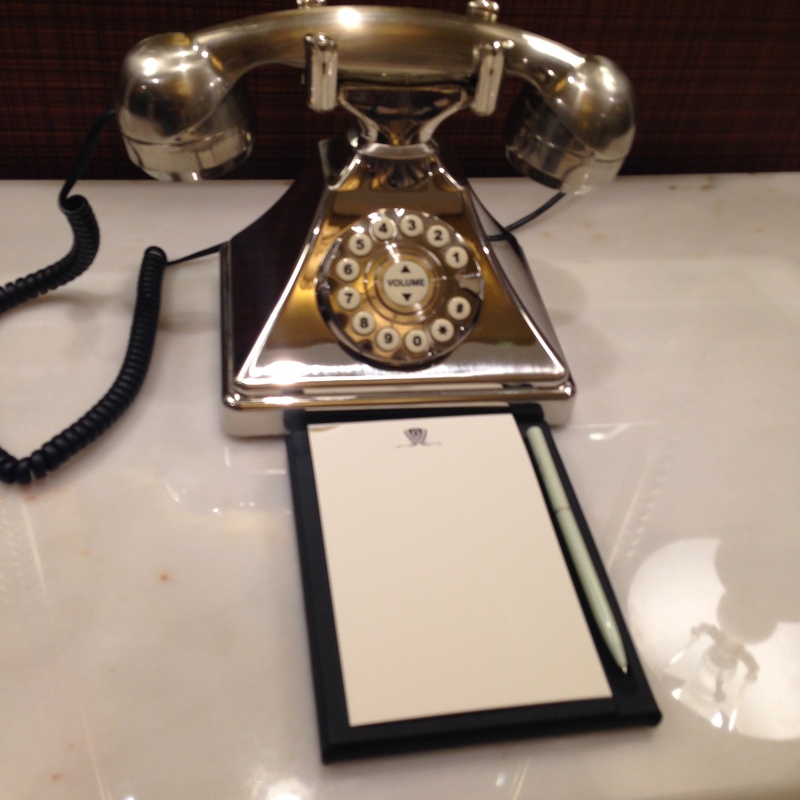 I felt like stopping and calling someone every time I walked past these silver phones that could be found throughout the hotel – just fabulous. 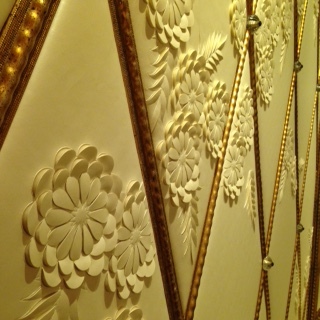 It’s hard not to have a great time in Las Vegas, especially when there is design inspiration all around. We can’t all have choreographed, fountain and light displays in our backyard, but I gathered so much inspiration that could be incorporated into residential design. It would be a sin not to share!